Perry Co. RTA members and local citizens have participated in many educational as well as entertaining programs such as hearing amazing facts about bees, learning about programs at the Perry County District Library and its branches, discovering the many services of the Perry County ESC, sharing hobbies at a summer picnic, keeping abreast of the latest legislation affecting retired teachers, learning about nutrition for seniors, and participating in yearly bake sales. PCRTA members donate yearly to the Perry County Food Pantries and have contributed items to Children’s Hospital Ronald McDonald House, supplied dental health kits to Lutheran Social Services, and collected school supplies for the county school districts. PCRTA awards a year five hundred dollar book grant to a senior enrolled in a college of education. It rotates among graduates of the four Perry County schools. In 2006, PCRTA was financially able to award two such grants. In 2007, PCRTA and Gamma Sigma, the local chapter of Delta Kappa Gamma Society International, partnered to supply chapter books to all first grade students in Southern Local School District. During the next three years PCRTA will do the same for each of the remaining county school districts. A special interest book is donated to the Perry County Library District Library in memory of deceased members. Martha Sagan, past president of PCRTA, serves in 2007 as District III Director for the Ohio Retired Teachers Association (ORTA). Past President Elizabeth Cooperrider served as the District Director from 1992 to 1996. Paul Mechling, also a past president of PCRTA, is a former State Representative. The Perry Co. RTA meets every other month (beginning in Feb.) on the 4th Tuesday at noon in various locations around the county. 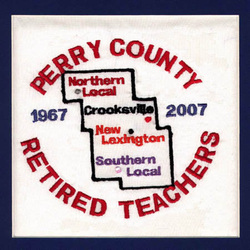 Organized in 1967, PCRTA continues to play a vital role in supporting and enriching the Perry County community and its schools and students. Nancy Canniff designed the quilt square. Presently PCRTA has 100 members, and is always looking for more.